Match the coziness and inviting allure of your family room with this rug's soft, shaggy polypropylene pile. Made with durable synthetic fibers, this rug showcases a sturdy machine-woven construction that doesn't stain easily. Dimensions 64.0 In. X 8.0 In. X 8.0 In. Area rug. Era Collection Divulge Olefin. I was disappointed that the colors of the rug received was very pale compared to the picture. Shag around edges is sparce. Green tones, not blue. Hard to believe since pictures shown are blue. I was shocked and disappointed. Don't be fooled by product pictures shown. I love my new rug. The color work well together and looks really nice with my furniture. I had hardwood floors so when I walk my rug my feet stay warm. I love the rug. The color combination is perfect. This rug fits well for the place I intended, and it's extremely soft and cushy underfoot, but the colors are more "similar" to each other than they appear, and tend to blend together a bit more. Which is OK if that's the look you're after, but I was hoping for more distance patches of color. Lovely in a room with blues and grays, however! 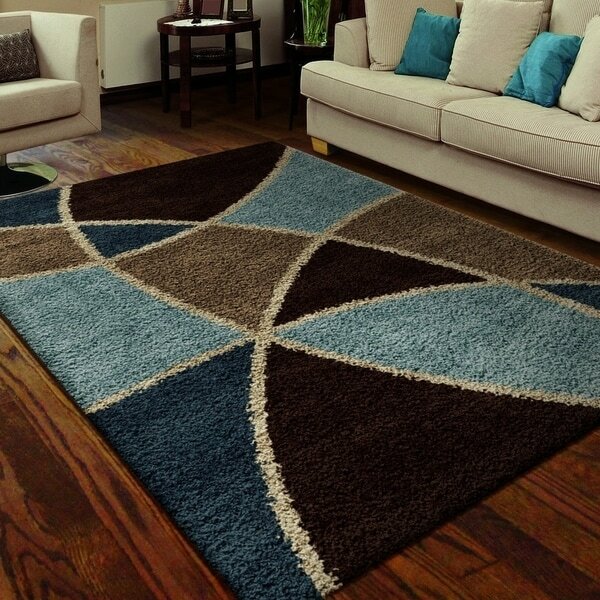 Love this rug and the others that compliment it! Beautiful colors and quality. Plush and thick to walk on. Our dog of course loves it too. Lovely, soft shag texture. Goes well with a tan, oak-brown, sky-blue color scheme. I personally don't like the binding being visible, which occurs on this rug, but the shag is long enough to cover the binding on the longer sides of the rectangle at least. I absolutely love this rug. The colors are exact and vibrant and totally added dimension to my room. The quality is very good and it doesn't shed. The rug was exactly what I was looking for. The colors are exactly as they are in the picture. The only thing I found was that it is a shag type rug which was not indicated on the website. However, it looks wonderful where I put it. The pictures and description of the rug did not do it justice! The colors are so vibrant and they blend so well together. So soft and comfy to walk on barefoot. Fits so perfectly in my den!!! Love it! This rug is great quality. It is exactly as shown in the picture. It is nice a fluffy. It was delivered quickly. Item is as described. Carpet is soft and plush. Colors are the same as pictured. Bottom stays put on my hardwood. May need a rubber pad if it's a busy area. The rug color is a bit more dull in person (especially the blue) but still very nice! It is a shag rug but does not feel cheap. Feels very good on bare feet. Shipping was quick. Great quality and the color is true to what is advertised! Would recommend this item to everyone. Very well made item. Colors are deep and true, density of shag is excellent. The rug is thick enough to prevent anything from sifting through to the floor. Very pleased with the product.